The Frigidaire 14.4 cu. ft. Upright Freezer allows you to conveniently store all of your favorite frozen foods. Power indicator light allows you to see that your freezer is working at a glance. Bright lighting for better visibility into your freezer. I have one and just purchased another manual defrost freezer ...I won't own a self defrost type freezer for large amounts of frozen foods in my home other than the everyday refrigerator's small side by side self defrost freezer. Each and every manual defrost freezer is a piece of cake to defrost. Shut off the freezer ( I do mine by the thermostat in the freezer no need to unplug ) . Take out all the frozen food ( I put mine in laundry baskets and top them off with a towel) and put them in a closed area nearby such as a bathtub/enclosed shower etc. and all the food will stay frozen. Then place a few large sponges in the bottom of the freezer, open the door all the way and leave for about 30 to 45 minutes (go vacuum, walk the dog etc.) return and empty the soaked sponges in a pail and remove any loosed bits of frozen ice and dry off the inside or wait a bit more until all is defrosted (if really badly iced up get out your hair dryer and use that on the bad sections if your in a rush) and your done. And... no freezer burn on your food ever ...as long as you wrap well before freezing up to 3 years...yes 3 years if handled properly, wrapped &amp; sealed well. Description says manual defrost, what does that mean? Do I have to manually defrost this as opposed to it being frost free? Yes but it's easy peasy...just turn the thermostat off ...remove your frozen food..(put in laundry baskets or something similar) cover with towels to keep food frozen ...open the door ..place large sponges to catch melting ice/water and go away for about 30-45 minutes and sponge the water into a pail..dry off the freezer if all ice is melted and your done...best part with manual defrost is your food won't get freezer burn if wrapped properly. will this freezer be ok to store and use in a unheated garage? can this 14.4 cu ft freezer be delivered? Yes it can be delivered. Mine was delivered for free. 14.4 cu. 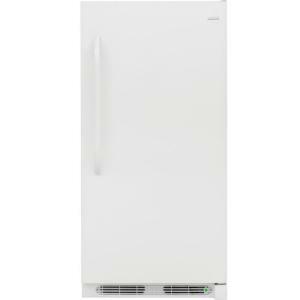 ft. Upright Freezer in White is rated 4.7 out of 5 by 663. Rated 5 out of 5 by Lyle from There was absolutely nothing that could be improved on -... There was absolutely nothing that could be improved on - the freezer is everything I hoped for, the price was good, follow up after placing order was excellent and delivery was quick and efficient. Rated 5 out of 5 by Styke from Product arrived as expected. Price was very fair for the quality of freezer. Very quiet operation... Product arrived as expected. Price was very fair for the quality of freezer. Very quiet operation with fast cooling. Indicator light is a nice feature. Rated 5 out of 5 by Paul from Freezer is working perfectly and is the right size for our needs. Freezer is working perfectly and is the right size for our needs. Rated 5 out of 5 by Sima from Very nice size so far going good we just bought... Very nice size so far going good we just bought two weeks ago working great.